The stem cell company Stemedica has made a name for itself in the media lately through hockey legend Gordie Howe, who received a non-FDA approved stem cell “treatment” in Mexico via Stemedica and its partner, Novastem. Howe, known as Mr. Hockey, had several strokes in late 2014 and his health was declining. Stemedica and Novastem gave Howe a free stem cell therapy. According to his family, Howe got a lot better. I’m glad he’s feeling better. What I’m less sure of is whether the stem cells or something else such as rehydration or simply some degree of natural recovery from the stroke helped Howe. Science-based medicine examined this case in two pieces that I recommend (here and here). 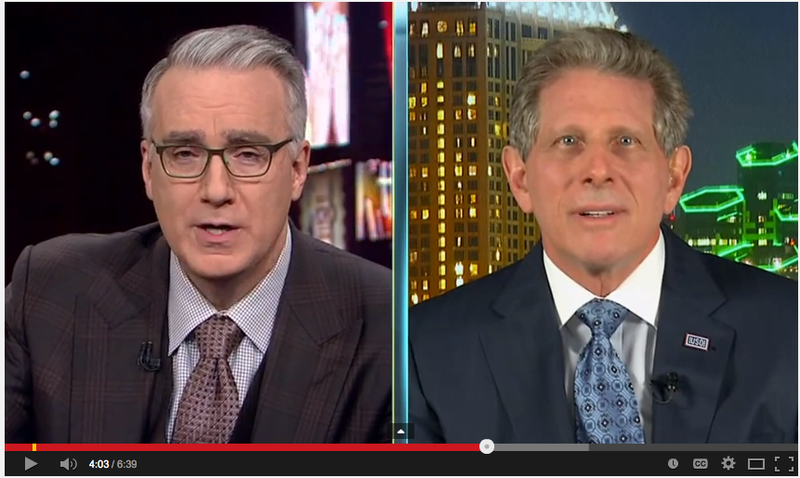 A new interview on this case–image above and video below–by Keith Olbermann in which he talked to Stemedica CEO Maynard Howe (no relation to Gordie Howe) sure seems like a big PR win for the company. If you watch it, it basically feels like an ad for Stemedica. I am a big fan of Olbermann, but he dropped the ball (err, puck) on this one. I have no issue with Gordie Howe and I wish him the best. What makes me concerned is that this kind of interview is almost certain to drive many regular folks to get potentially risky, unproven stem cell “treatments”. “Since Stemedica is known to sue people who criticize them (I hope they don’t sue me for saying that), I will be very careful about how I present the facts. There are two things that worry me. First, the Stemedica representative did not say that in addition to the mesenchymal stem cells they used for treating Gordie Howe, they also used cells from aborted fetuses, which is one of the reasons that the treatment was done in Mexico. I would expect that to raise some ethical concerns. The second is that there will soon be solid evidence about whether or not mesenchymal stem cells reduce the severity of stoke. A company called Athersys is currently finishing a Phase 2 trial that has been specifically designed to determine whether mesenchymal stem cells have any effect on stroke https://www.clinicaltrials.gov/ct2/show/NCT01436487?term=athersys&rank=2. Stemedica’s trial in the US is essentially a repeat of what Athersys has already done- show safety https://www.clinicaltrials.gov/ct2/show/NCT01297413?term=stemedica&rank=1. This is a “safe” choice for a safety trial, since it’s already been done. The bottom line is that the way it stands now the Olbermann interview has not helped provide clarity on this complicated issue, so a follow up piece from Olbermann with some depth and varying opinions is much needed for balance. I engaged Olbermann on Twitter on this. Perhaps he might do a broader, probing look at stem cells in pro sports? Let’s see. I suggested it. In Bart Starr stem cell treatment for stroke, following Howe to Mexico? 2) According to an earlier article, Gordie Howe was treated with both MSCs and Neural stem cells and not based on the protocol of the Stemedica FDA trial showed in the link that only uses MSCs. 3) Another difference is that the Athersys trial, which has completed enrollment, threats patients 24-48 hours after the stroke. Gordie was treated months after onset. This is an important distinction as Athersys believes that one important mechanism of action involves mitigating the ove-rinflammatory cascade response of the spleen that does much damage in the early days following a stroke. I have no idea if teh therapy Mr. Howe recieved was effective or just a fortunate coincidence. However, Kieth Olberman is not a medical reporter and can’t be expected to ask the same questions that Paul Knoepfler would ask. I thought he did a pretty good job as a layman in this regard. Calling it a puff piece, though, seems a bit unfair. You raise some good points re: Athersys here. Regarding the interview, I do believe it was a puff interview. If you watch it again you can see that Olbermann can be heard ooh’ing and ah’ing and saying “wow” in admiration numerous times. He also did not ask tough questions. I also felt like Olbermann went the extra mile to sell this with his own words and over the top statements such as that Gordie Howe thanks to this stem cell treatment was doing “everything but the Macarena”. Wow. Sounds like Dr. Oz. I realize, however, that “puff” is in the eye of the beholder so I’d imagine there will be different views on that. It IS an AMAZING story and his oohing and awing are appropriate considering that Olberman had, in his own words had bid fair well to Mr. Howe. By all reports, Mr. Howe HAS HAD an incredible comeback. Watch the interview again with a different starting perspective as I believe I did. I share your concerns about the wild, wild west of unproven stem cell therapy treatments but you should consider that your predisposition may slant your initial reaction. This interview went into much details about the process of FDA approval and why he was treated in Mexico, which surprised me. I see your points, but a national reporter has to be more careful than a viewer. It is their job to probe into a story beyond the surface. One could argue for an apparently incredible story of this kind it is even more important for a journalist to be cautious and bend over backwards to ask tough questions. I didn’t see that. For example, he could have asked about safety data, the prices for such treatments if one is not a celebrity who gets a freebie, and how they could be sure the treatment specifically was what helped Mr. Howe. Olbermann also seems to have made a complete mistake by saying the treatment of Howe was done using only adult stem cells. What concerns me most is that this interview could lead many ordinary people to go out there and get these interventions without realizing the potential risks, costs, and such. In my view it wasn’t puff piece. It was just a legitimate attempt by an interviewer to get information about how a hockey legend recovered without knowing all the issues that are discussed on this blog every day. If true, most would consider Mr. Howe’s recovery a miracle, even if a scientist would not accept that it was the stem cells that did it. That doesn’t make this a puff piece, IMHO. Hi Jeanne, I could not find anything that mentioned the source of the neural cells was fetal. I had assumed they were adult donors but I don’t know the answer other than the reference made by Olberman that they were not embryonic (at the beginning of the interview). Do you have a specific link or reference? I’m just not sure about this. Could they be adult based from donated organs? I heard about the neural stem cells from the family’s statement: “The treatment included neural stem cells injected into the spinal canal on Day 1 and mesenchymal stem cells by intravenous infusion on Day 2.” Neural stem cells are derived from aborted fetal brain tissue and are used by some researchers and companies- for example, Stem Cells, Inc. Try googling HuCNS-SC. Thanks, Ray. I know that there are several bone marrow-derived cells being used, and a lot of that has to do with a company’s patent portfolio. Cells have two formats- mesenchymal or epithelial. If they look like fibroblasts, I call them mesenchymal. I’m looking forward to someone doing some genomics analysis to precisely define their cells. What do you think about the other cell type used- fetal-derived neural stem cells? Stemedica’s allogeneic neural stem cells (NSCs) are taken from donated brain tissue and produced in a low oxygen environment, allowing them to display ischemic tolerant properties. We are currently applying for an IND to conduct a clinical trial for spinal cord injury in the United States and seeking Swiss regulatory approval to conduct clinical studies for the treatment of Alzheimer’s disease, using NSCs in conjunction with Stemedica’s MSCs. Doesn’t mean they are not but my guess is that they are not from fetuses. I’m trying to learn more on the “fetal” question. Thanks for fishing that out Paul. To me it is not really relevant whether the source is adult or fetal although I’m sure some may object, as do the many who object to ESCs. To be fair, we should consider the possibility this treatment DID work to help Mr. Howe. Stemedica’s patent (US 8420394) also explicitly states that the NSCs are from the forebrain of an 8-10 week-old human fetus. has Novasteam already answered your questions? They may tell some more details. I am very doubtfully, too, but everytime a new therapy seems to be successful, we should take a second look, Just remember, when some popular people have gone to Germany to receive a non general accepted therapy (orthokin and similar therapies) for their joints, which was only available in Germany. (in newspapers I read the following names Kobe Bryant, Demi Moore, Alex Rodriguez). The new therapy in Germany was effective, for example take a look at Kobe Bryant, who has returned to play basketball. However this therapy was not generally accepted and he needed to go to Germany to receive it. So if a therapy is not accepted, it must not absolutely mean, that it is not working in any case. I am very doubtfully about the therapy of Gordie Howe, but nevertheless it seems to be worthy to observe it. .
CEO Howe comes across as the consummate politician. The interview was neither better nor worse than the typical political interview. Every journalist should know that there are 2 sides to a coin. The rest of us know that there are 3. From what I read,Gordie had dementia prior to his strokes.Odds are his 86 year old MSC’s are not very young.Young cells are better and promote regeneration.The fetal cells are most likely the cause of Gordie’s return to driveway hockey.His son,a cardiologist,has verified his fathers progress. I suppose we can’t believe the M.S. patients who have been getting better from transplants.Ocata’s amazing results with AMD,where eyes only get worse,must be some sort of placebo effect. You guys must not believe in global warming either? What do these little cells have to do to convince you that they work and are generally safe. If it walks like a duck and quacks like a duck,it must be a duck.You guys are all waiting for it to lay an egg,prefferably getting on it’s face. Too bad Gordie can’t lay Golden Eggs for you naysayers.Whoever moves this technology forward and treats very needy patients will lay their own golden eggs. Me thinks maybe some professionals are jealous because these guys are helping people (and themselves), while here in the USA,we’re just waiting and waiting and waiting. ISCO is starting it’s Parkinsons trial in Australia because it said it would cut years off the trial.They actually said the Australian FDA tries to help and expedite their efforts.Companies are working elsewhere because our own agencies are protecting Big Pharma and the gravy train. So it appears success can only be an exageration or puff as those clinicians here seem to think. I’m glad to be a laymen so I can see the facts as they are. Me thinks that thou protest too much. P.S. Maybe it’s my Parkinson’s and a lack of treatment that opens my eyes. I agree that there is every likelihood that some people really are helped by some of these treatments. And I think that patients should have options to access treatments — especially when alternatives are either not available or are known to be ineffective/harmful. I think that the issue Paul raises about this interview is that results are reported in a way that is incomplete, far from transparent, and may be misleading. I agree with him in this particular instance. I also think that patients can benefit from the information provided in the comments above by professionals in this field. What is really lacking in the above comments (from my point of view) is input from medical doctors engaged this field. I am just a limo driver who got to drive Mr. hockey to the airport. What a pleasure it was to meet him. How about you all take it from the words of his son Dr. Murry Howe. Let us just remember that one response without proper controls does not a clinical cure make.